The National Railroad Passenger Corporation, doing business as Amtrak, is a publicly funded railroad service operated and managed as a for-profit corporation which began operations on May 1, 1971, to provide intercity passenger train service in the United States. Amtrak operates more than 300 trains each day on 21,300 miles (34,000 km) of track with select segments having civil operating speeds of 150 mph (240 km/h) and connecting more than 500 destinations in 46 states in addition to three Canadian provinces. In fiscal year 2012, Amtrak served a record 31.2 million passengers and had $2.88 billion in revenue while employing more than 20,000 people. Nearly two-thirds of passengers come from the ten largest metropolitan areas and 83% of passengers travel on routes of 400 miles or less. Its headquarters is at Union Station in Washington, D.C.
From the mid-19th century until approximately 1920, nearly all intercity travelers in the United States moved by rail. The rails and the trains were owned and operated by private, for-profit organizations. Approximately 65,000 railroad passenger cars operated in 1929. For a long time after 1920, passenger rail's popularity diminished and there was a series of pullbacks and tentative recoveries. Rail passenger revenues declined dramatically between 1920 and 1934 because of the rise of the automobile. In the same period, many travelers were lost to interstate bus companies such as Greyhound Lines. However, in the mid-1930s, railroads reignited popular imagination with service improvements and new, diesel-powered streamliners, such as the gleaming silver Pioneer Zephyr and Flying Yankee. Even with the improvements, on a relative basis, traffic continued to decline, and by 1940 railroads held 67 percent of passenger-miles in the United States. World War II broke the malaise. During the war, troop movements and restrictions on automobile fuel generated a sixfold increase in passenger traffic from the low point of the Great Depression. After the war, railroads rejuvenated overworked and neglected fleets with fast and often luxurious streamliners – epitomized by the Super Chief and California Zephyr – which inspired the last major resurgence in passenger rail travel. The postwar resurgence was short-lived. In 1946, there remained 45 percent fewer passenger trains than in 1929, and the decline quickened despite railroad optimism. Passengers disappeared and so did trains. Few trains generated profits; most produced losses. Broad-based passenger rail deficits appeared as early as 1948 and by the mid-1950s railroads claimed aggregate annual losses on passenger services of more than $700 million (almost $5 billion in 2005 dollars when adjusted for inflation). By 1965, only 10,000 rail passenger cars were in operation, 85 percent fewer than in 1929. Passenger service was provided on only 75,000 miles (120,000 km) of track, a stark decline. The 1960s also saw the end of railway post office revenues, which had helped some of the remaining trains break even. The causes of the decline of passenger rail in the United States were complex. Until 1920, rail was the only practical form of intercity transport, but the industry was subject to government regulation and labor inflexibility. By 1930, the railroad companies had constructed, with private funding, a vast and relatively efficient transportation network, but when the federal government began to construct the National Highway System, the railroads found themselves faced with unprecedented competition for passengers and freight with automobiles, buses, trucks, and aircraft, all of which were heavily subsidized by the government road and airport building programs. In 1916, the amount of track in the United States peaked at 254,251 miles (409,177 km), compared to 140,695 miles (226,427 km) in 2007 (although it remained the largest rail network of any country in the world). Some routes had been built primarily to facilitate the sale of stock in the railroad companies; they were redundant from the beginning. These were the first to be abandoned as the railroads' financial positions deteriorated, and the rails were routinely removed to save money on taxes. Many rights-of-way were destroyed by being broken up and built over, but others remained the property of the railroad or were taken over by local or state authorities and turned into rail trails. From approximately 1910 to 1921, the federal government introduced a populist rate-setting scheme. During World War I the railroads proved incapable of functioning as a cohesive network. This forced the United States Government to nationalize the rail industry temporarily. In the 1920s railroad profits stagnated, many redundant and unprofitable lines were abandoned, and many passenger facilities were allowed to fall into a cycle of deferred maintenance, all of which in small ways drove passengers away, either by higher fares or less appealing service. At the same time, the rise in popularity of the automobile and US Highways such as the Lincoln Highway began to eat away at local rail passenger traffic. Increases in labor costs also further hindered the railroads' ability to make profits on smaller and more sparsely populated lines. The primary regulatory authority affecting railroads, beginning in the late 19th century, was the Interstate Commerce Commission (ICC). The ICC played a leading role in rate-setting which would at times hindered railroads' ability to be profitable in the passenger market. In the 1930s, train speeds were ever increasing, but no advance were being made in signalling and safety systems to prevent collisions. This led to the horrific Naperville train disaster of 1946 and other crashes in New York in 1950. In 1947 the ICC issued an order requiring US railroads, by the end of 1951, to install automatic train stop, automatic train control or cab signalling wherever any trains would travel at 80 mph (130 km/h) or faster. The ICC was even more critical of corporate mergers. Many combinations which railroads sought to complete were delayed for years and even decades, such as the merger of the New York Central Railroad and Pennsylvania Railroad, into what eventually became Penn Central, and the Delaware, Lackawanna and Western Railroad and Erie Railroad into the Erie Lackawanna Railway. By the time the ICC approved the mergers in the 1960s, slower trains, years of deteriorating equipment and station facilities, and the flight of passengers to air and automobile transportation had taken their toll and the mergers were unsuccessful at preserving these railroad's passenger train service. It is important to note the Erie Lackawanna was never a major hauler of passengers, nor its predecessor roads, and was mostly a freight railroad. The Penn Central merger was a failure because it merged two large struggling railroads on paper only, two separate management structures remained with little or no integration of assets or management of the former Pennsylvania Railroad and New York Central system. The massive overhead costs of this operating scheme played a far greater role in the Penn Central failure than any actions take by the ICC or any other US Government agency. At the same time, railroads carried a substantial tax burden. A World War II–era excise tax of 15% on passenger rail travel survived until 1962. Local governments, far from providing needed support to passenger rail, viewed rail infrastructure as a ready source for property tax revenues. In one extreme example, in 1959, the  To this day, railroads are generally taxed at a higher rate than other industries, and the rates vary greatly from state to state. Railroads also faced antiquated work rules and inflexible relationships with trade unions. Work rules did not adapt to  Average train speeds had doubled from 1919 to 1959, but unions resisted efforts to modify their existing 100- to 150-mile work days. As a result, railroad workers' average work days were roughly cut in half, from 5–7½ hours in 1919 to 2½–3¾ hours in 1959. Labor rules also perpetuated positions that had been obviated by technology; for example, when steam locomotives were replaced with diesel locomotives the rules required a fireman or stoker aboard the engine at all times, even in switching yards. Between 1947 and 1957, passenger railroad financial efficiency dropped by 42% per mile. While passenger rail faced internal and governmental pressures, new challenges appeared that undermined the dominance of passenger rail: highways and commercial aviation. The passenger rail industry declined as governments put money into the construction of highways and government-owned airports and the air traffic control system. As automobiles became more attainable to most Americans, the freedom, increased convenience and individualization of automobile travel became the norm for most Americans. Government actively began to respond with funds from its treasury and later with fuel-tax funds to build a non-profit network of roads not subject to property taxation. Highways then surpassed the for-profit rail network that the railroads had built in previous generations with corporate capital and government land grants. All told between 1921 and 1955 governmental entities, using taxpayer money and in response to taxpayer demand, financed more than $93 billion worth of pavement, construction, and maintenance. In the 1950s affordable commercial aviation expanded as the Jet Age arrived. Governmental entities built urban and suburban airports, funded construction of highways to provide access to the airports, and provided air traffic control services. Until 1966, most U.S. Postal Service mail was transported on passenger trains. The mail contracts kept many passenger trains economically viable. In 1966, the U.S. Postal Service switched to trucks and airplanes, subsidizing planes instead of trains, which no longer had mail as a source of revenue. Amtrak's former logo, known as the "inverted arrow" or the "pointless arrow" (1971-2000). It is still in use on some signs, stations and cars. 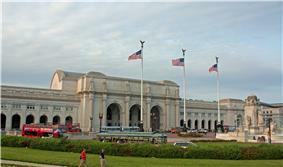 Union Station, the headquarters of Amtrak in Washington, D.C. In the late 1960s, the end of passenger rail in the United States seemed near. First had come the requests for termination of services; then came the bankruptcy filings. The Pullman Company became insolvent in 1969,:147 followed, in 1970, by the dominant railroad in the Northeastern United States, the Penn Central. :234 It now seemed that passenger rail's financial problems might bring down the railroad industry as a whole, yet few in government wanted to be held responsible for the extinction of the passenger train. Nearly everyone involved expected the experiment to be short-lived. The Nixon administration and many Washington insiders viewed the NRPC as a politically expedient way for the President and Congress to give passenger trains a "last hurrah" as demanded by the public. They expected Amtrak to quietly disappear as public interest waned. Proponents also hoped that government intervention would be brief, but their view was that Amtrak would soon support itself. Neither view has proved correct. Popular support has allowed Amtrak to continue in operation longer than critics imagined, while financial results have made a return to private operation infeasible. Of the railroads that were still offering long-distance passenger service in 1971 only six declined to join Amtrak. Chicago South Shore and South Bend Railroad passenger trains, which operated in the roughly 100-mile (160 km) industrial corridor between Chicago, Illinois and South Bend, Indiana continue to operate as the Northern Indiana Commuter Transportation District's South Shore Line. The mixed freight/passenger trains. This limited passenger service continued until the company was sold to the Seaboard System in 1983. The Reading Company maintained passenger services on three short (less than 100 mile) lines from Philadelphia to Newark Penn Station, NJ, Bethlehem, PA, and Pottsville, PA. The Reading Company merged into Conrail in 1976. Passenger service to Bethlehem and Pottsville was discontinued in 1981, while passenger service to New Jersey was cut back by roughly 50 miles (80 km) to terminate in West Trenton, NJ. The passenger services which remained with Conrail were quickly transferred to SEPTA to form half of their Regional Rail network. The Chicago, Rock Island and Pacific Railroad (the Rock Island) determined that the fee to join Amtrak was greater than the cost of the statutory five years of operations for its remaining intercity passenger service. The Rock Island continued operating two truncated passenger trains (the Peoria Rocket and the Quad Cities Rocket) on short routes out of Chicago until 1978. Southern Railway relinquished some operations, but continued four routes, including its Southern Crescent. Continued losses convinced Southern Railway to relinquish remaining passenger operations to Amtrak in 1979. Amtrak continues a variation of the Southern Crescent service as the Crescent. The Denver and Rio Grande Western Railroad (DRGW) continued operating its portion of the original California Zephyr service, renamed the Rio Grande Zephyr, between Denver, Colorado and Ogden, Utah. In operation until 1983, the Rio Grande Zephyr was the last privately operated long-distance passenger service in the United States. Amtrak subsequently rerouted its modern version of the California Zephyr to follow DRGW's route between Denver and Salt Lake City. The Nixon administration secretly agreed with some railroads that Amtrak would be shut down after two years. After Fortune magazine exposed the manufactured mismanagement in 1974, Louis W. Menk, chairman of the Burlington Northern Railroad, remarked that the story was undermining the scheme to dismantle Amtrak. The Coast Starlight, looking very much like a Southern Pacific train, heads north out of San Jose, California on May 1, 1971, Amtrak's first day of operation. Amtrak began operations on May 1, 1971. The corporation was molded from the passenger rail operations of 20 out of 26 major railroads in operation at the time. The railroads contributed rolling stock, equipment, capital, and crews. In return, they received approval to discontinue their passenger services, and their choice of tax breaks or common stock in Amtrak. Amtrak received no rail tracks or right-of-way at its inception. Railroads that shed passenger operations were expected to host Amtrak trains on their tracks, for a fee. There was a period of adjustment during which Amtrak worked on numerous renovations and improvements. All Amtrak's routes were continuations of prior service, although Amtrak pruned about half the passenger rail network. Of the 364 trains operated previously, Amtrak only continued 182. On trains that continued, to the extent possible, schedules were retained with only minor changes from the Official Guide of the Railways. Former names largely were continued. Pennsylvania Railroad Metroliner car, built by Budd, c. 1968. Several major corridors became freight-only, including New York Central Railroad's Water Level Route across New York and Ohio and Grand Trunk Western Railroad's Chicago to Detroit service, although passenger service soon returned to the Water Level Route with the introduction of the Lake Shore Limited. Reduced passenger train schedules created headaches. A 19-hour layover became necessary for eastbound travel on the James Whitcomb Riley between Chicago and Newport News. Amtrak inherited problems with train stations, most notably deferred maintenance, and redundant facilities resulting from competing companies that served the same areas. On the day it started, Amtrak was given the responsibility of rerouting passenger trains from the seven train terminals in Chicago (LaSalle, Dearborn, Grand Central, Randolph, Chicago Northwestern Terminal, Central, and Union) into just one, Union Station. In New York City, Amtrak had to pay to maintain Penn Station and Grand Central Terminal because of the lack of track connections to bring trains from upstate New York into Penn Station, a problem not rectified until the building of the Empire Connection in 1991. Detroit's Amtrak Station. During consolidation Amtrak had to abandon large Union Stations and routed trains into smaller, cheaper to maintain facilities jokingly referred to as "Amshacks" due to their basic design. In many cases, Amtrak had to abandon service into large Union Stations and Central Terminals, routing trains into smaller Amtrak-built facilities down the line, jokingly referred as "Amshacks" due to their basic design. 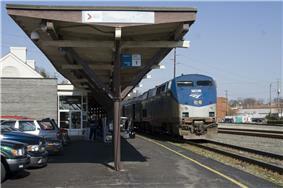 In later years Amtrak has pushed to start reusing some older stations that can be salvaged. Stations such as Cincinnati Union Terminal, Kansas City Union Station and St Paul Union Depot have since had Amtrak passenger service restored. Stations like Buffalo Central Terminal and Michigan Central Station continue to wait and stations such as St Louis and Houston have found other uses or have been demolished. On the other hand, merged operations presented efficiencies such as the combination of three West Coast trains into the Coast Starlight, running from Los Angeles to Seattle. The Northeast Corridor received an Inland Route via Springfield, Massachusetts, thanks to support from New York, Connecticut and Massachusetts. The North Coast Hiawatha was implemented as a second Pacific Northwest route. The Milwaukee to St. Louis Abraham Lincoln and Prairie State routes also commenced. The first all-new Amtrak route, not counting the Coast Starlight, was the Montrealer/Washingtonian. That route was inaugurated September 29, 1972, along Boston and Maine Railroad and Canadian National Railway track that had last seen passenger service in 1966. Amtrak was also instrumental in restoring service in the Empire Corridor of upstate New York, between Albany and Niagara Falls, with its Empire Service, a service that was discontinued in the sixties by the New York Central and Penn Central. This main line became Amtrak's "jewel" asset, and helped the railroad generate significant revenues. While the NEC ridership and revenues were higher than any other segment of the system, the cost of operating and maintaining the corridor proved to be overwhelming. As a result, Amtrak's federal subsidy was increased dramatically. In subsequent years, other short route segments not needed for freight operations were transferred to Amtrak. Nevertheless, in general, Amtrak remained dependent on freight railroads for access to most of its routes outside of the northeast. A Burlington Northern EMD F3 leads the North Coast Hiawatha into Yakima, Washington in July 1971, an example of early Amtrak "rainbow" consists, made up of equipment still painted in the colors of freight railroads. Amtrak's early years are often called the Rainbow Era, which refers to the ad hoc arrangement of the rolling stock and locomotives from a pool of equipment, acquired by Amtrak, at its formation, that consisted of a large mix of paint schemes from their former owners. This rolling stock, which for the most part still bore the pre-Amtrak colors and logos, formed the multi-colored consists of early Amtrak trains. By mid-1971, Amtrak began purchasing some of the equipment it had leased, including 286 second-hand locomotives, of the EMD E and F types, 30 GG1 electric locomotives, and 1290 passenger cars, and continued leasing even more motive power. By 1975 the official Amtrak color scheme was painted on most Amtrak equipment and newly purchased locomotives and rolling stock began appearing. In 1979 the Pres. Carter administration and Congress' Reorganization Act of 1979 pressured Amtrak to drop several lines. The main lines to be dropped were the North Coast Hiawatha from Chicago to Seattle, via southern North Dakota and southern Montana. Carter wanted to eliminate the Southwest Chief from Los Angeles to Chicago, but that route was saved. The Hilltopper and the National Limited (thereby eliminating service to Columbus) were also eliminated in October of that year. A Michigan-bound Amtrak led by a F40PH in still older Phase III paint livery passes through Porter, Indiana, after departing from Chicago in 1993. The high-speed Acela Express at New Haven Union Station. Ridership stagnated at roughly 20 million passengers per year amid uncertain government aid from 1981 to about 2000. In the 1990s, Amtrak's stated goal remained operational self-sufficiency. By this time, however, Amtrak had a large overhang of debt from years of underfunding, and in the mid-1990s, Amtrak suffered through a serious cash crunch. To resolve the crisis, Congress issued funding but instituted a glide-path to financial self-sufficiency, excluding railroad retirement tax act payments. Passengers became "guests" and there were expansions into express freight work, but the financial plans failed. Amtrak's inroads in express freight delivery created additional friction with competing freight operators, including the trucking industry. Delivery was delayed of much anticipated high-speed trainsets for the improved Acela Express service, which promised to be a strong source of income and favorable publicity along the NEC between Boston and Washington, D.C.
Ridership increased during the first decade of the 21st century after implementation of capital improvements in the NEC and rises in automobile fuel costs. In fiscal year 2013, Amtrak set its 10th ridership record in 11 years (the recession year of 2009 broke the string.). Total passengers increased from about 20.9 million passengers in 2000 to 30.6 million passengers for the 12 months ending September 30, 2013. Passenger revenue also set a record at $2.1 billion, up 4.2% over fiscal 2012. Combined, the long-distance trains had their best ridership in 20 years, with 4.8 million passengers. Ridership on the NEC was essentially flat at 11.4 million, the second best year after 2012, though revenues were up 5.3%. State-supported corridor trains were up 2.2% to 15.4 million. According to Amtrak, in fiscal year 2011, an average of more than 82,000 passengers rode on up to 300 Amtrak trains per day. Through the late 1990s and very early 21st century, Amtrak could not add sufficient express freight revenue or cut sufficient other expenditures to break even. By 2002, it was clear that Amtrak could not achieve self-sufficiency, but Congress continued to authorize funding and released Amtrak from the requirement. Amtrak also replaced its F40PH units with the GE Genesis. Amtrak engines #1 and #56, both GE Genesis P42DC diesels, pulling the eastbound California Zephyr at Grand Junction, Colorado, April 2012. Amtrak's leader at the time, David L. Gunn, was polite but direct in response to congressional criticism. In a departure from his predecessors' promises to make Amtrak self-sufficient in the short term, Gunn argued that no form of passenger transportation in the United States is self-sufficient as the economy is currently structured. Highways, airports, and air traffic control all require large government expenditures to build and operate, coming from the Highway Trust Fund and Aviation Trust Fund paid for by user fees, highway fuel and road taxes, and, in the case of the General Fund, from general taxation. Before a congressional hearing, leading Amtrak critic Arizona Senator John McCain demanded the elimination of all operating subsidies; Gunn responded by asking the Senator if he would also demand the same of the commuter airlines, upon which the citizens of Arizona are dependent. McCain, usually not at a loss for words when debating Amtrak funding, did not reply. Under Gunn, almost all the controversial express freight business was eliminated. The practice of tolerating deferred maintenance was reversed to eliminate a safety issue. Alexander Kummant, Amtrak's chief from 2006 to 2008, was committed to operating a national rail network, and he opposed the notion of putting the NEC under separate ownership. He said that shedding the system's long distance routes would amount to selling national assets that are on par with national parks, and that Amtrak's abandonment of these routes would be irreversible. Amtrak unsuccessfully sought annual congressional funding of $1 billion for ten years. 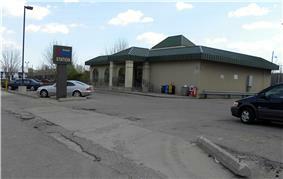 Kummant also stated that the investment was moderate in light of federal investment in other modes of transportation. In 2011, Amtrak announced its intention to build a small segment of a high-speed rail corridor from Penn Station in NYC, under the Hudson River in new tunnels, and doubletracking the line to Newark, NJ called the Gateway Project, estimated to cost $13.5 billion. Locomotive No. 66 at Los Angeles Union Station. Amtrak locomotives No. 156 and No. 66 in 40th Anniversary paint schemes at Galesburg. From May 2011 to May 2012, Amtrak celebrated its 40th anniversary with festivities across the country that started on National Train Day (May 7, 2011). A commemorative book entitled Amtrak: An American Story was published, and a documentary was created. Four commemorative locomotives and a 40th Anniversary Exhibit Train toured the country. The Exhibit Train visited 45 communities and welcomed more than 85,000 visitors. It was an entirely rebuilt train powered by GE Genesis locomotives and included three refurbished ex-Santa Fe baggage cars and a food service car. Four Genesis locomotives were painted into retired Amtrak paint schemes: No. 156 was in Phase 1 colors, No. 66 was in Phase 2 colors, No. 145 and No. 822 were in Phase 3 colors (822 pulled the Exhibit train), and No. 184 was in Phase 4 colors. As of 2014, the overwhelming majority of Amtrak passengers enjoy access to free Wi-Fi. The first Amtrak train to offer free Wi-Fi service to passengers was the Downeaster in 2008, followed by the Acela Express in 2010 and the "Regionals" on the NEC soon after, and then the Amtrak Cascades in 2011. 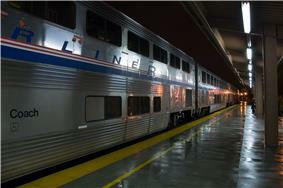 Starting in February 2014, Amtrak is rolling out Wi-Fi on corridor trains out of Chicago. When all the Midwest cars offer the AmtrakConnect service, about 85% of all Amtrak passengers nationwide will enjoy Wi-Fi access. E-Ticketing was officially rolled out to the national network on July 30, 2012. According to an Amtrak news release detailing the rollout, eTicketing provides Amtrak with "more accurate knowledge in realtime of who is on the train which greatly improves the safety and security of passengers; en route reporting of onboard equipment problems to mechanical crews which may result in faster resolution of the issue; and more efficient financial reporting." 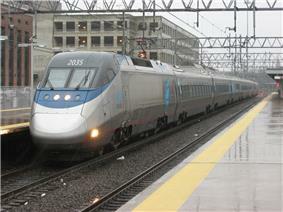 Amtrak had launched its new e-ticketing system on the Downeaster in November 2011. On-board food and beverage service and warehouse inventories are now managed in real time by electronic systems. The anticipated savings led CEO Boardman to predict that food service could break even within a few years. Two Amtrak routes were extended in 2012. The Downeaster was extended from Portland to Brunswick, Maine in November, and a daily Northeast Regional trip was extended from Richmond to Norfolk, Virginia in December. Amtrak is no longer required by law, but is encouraged, to operate a national route system. Amtrak has some presence in 46 of the 48 contiguous states, all except Wyoming and South Dakota. Service on the Northeast Corridor, between Boston, and Washington, D.C., as well as between Philadelphia and Harrisburg, is powered by overhead electric wires; for the rest of the system, diesel locomotives are used. Routes vary widely in frequency of service, from three-days-a-week trains on the Sunset Limited route (Los Angeles, to New Orleans), to weekday service several times per hour on the NEC, (Boston to Washington, D.C.) Amtrak also operates a captive bus service, Thruway Motorcoach, which provides connections to train routes. In addition, the company owns Passenger Railway Insurance. The most popular and heavily used services are those running on the NEC, which include the Acela Express and Northeast Regional. The NEC serves Boston; Providence; New Haven; New York City; Newark; Philadelphia; Wilmington; Baltimore; Washington, D.C.; and some smaller cities between. 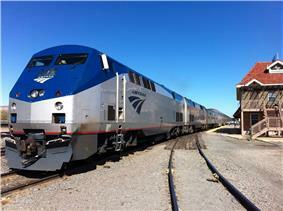 The NEC services accounted for 11.4 million of Amtrak's 31.6 million passengers in fiscal year 2013. Regional services in California, subsidized by the California Department of Transportation are the most popular services outside of the NEC. They are the Pacific Surfliner (San Diego-L.A.-Santa Barbara-San Luis Obispo) with 11 trains each way on the core San Diego-Los Angeles section, the Capitol Corridor (Sacramento-Oakland-San Jose) connect Sacramento with Oakland with 15 trains a day each way, and about half of those extend to San Jose, and the San Joaquin (Sacramento/Oakland-Stockton-Fresno-Bakersfield) services with four round-trips daily from Oakland and from Sacramento with two roundtrips, through California's Central Valley, stopping at Stockton, Merced, Fresno, and several smaller cities to Bakersfield. (Passengers going to Los Angeles must take an Amtrak Thruway Motorcoach bus service that takes roughly nine hours). Together the California corridor trains accounted for a combined 5,627,000 passengers in fiscal year 2013. the fifth busiest in the Amtrak system. Other popular corridors include New York State's Empire Service, NYC-Albany-Syracuse-Rochester-Buffalo-Niagara Falls-Toronto, with 1,488,000 passengers last year, and Pennsylvania's Keystone Service NYC-Philadelphia-Lancaster-Harrisburg with 1,467,000 passengers. The Cascades Service has four trains a day each way in the main section, Seattle-Portland, two trains a day extending to Vancouver, British Columbia, and another two daily to Eugene. The Cascades service uses Talgo tilting trains, which has allowed faster runs on a very curvy route. Cascades trains, supported by the States of Washington and Oregon, carried 812,000 riders. Stimulus funded work underway will bypass a single-track tunnel section, among other upgrades, to shave more time off the trip. The work will increase the track capacity to handle two more trains each way on the core Seattle-Portland segment by 2017, providing six Amtrak Cascades daily plus the daily Coast Starlight. State-supported services have been growing in Virginia with the addition of a Regional train extended from Washington, D.C. to Lynchburg, and a further extension of a Regional that had been serving Richmond to continue to Norfolk. These trains, plus the existing service to Newport News, had 892,000 passengers last year, in addition to passengers on Regional trains to Richmond (not broken out in Amtrak reports). These state-supported services, called Amtrak Virginia, are very cost effective because they use equipment that would otherwise be parked in the yard in Washington overnight; instead the trains are used early morning and evenings to provide extra service and gain added revenue. 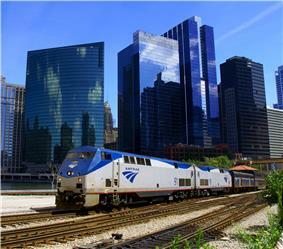 A growing network of state-supported trains radiates from Chicago and overlap some of Amtrak's long-distances routes. The corridors include Chicago-Kalamazoo-Ann Arbor-Dearborn-Detroit-Pontiac (with three daily Wolverines), Chicago-Kalamazoo-Lansing-Port Huron (with one daily Blue Water), Chicago-Grand Rapids (with one daily Pere Marquette), Chicago-Milwaukee (with seven daily Hiawathas plus the daily Empire Builder), Chicago-St Louis (with four daily Lincoln Service plus the daily Texas Eagle), Chicago-Champaign-Carbondale (with two daily corridor trains, the Illini and Saluki plus the daily City of New Orleans), Chicago-Galesburg (with two daily corridor trains, the Illinois Zephyr and the Carl Sandburg, plus the daily California Zephyr and Southwest Chief) with the corridor trains continuing to Quincy. In addition, The River Runner offers twice daily service St. Louis-Kansas City. After the State of Illinois stepped up to subsidize two more trains each way St Louis-Chicago, ridership more than doubled. The more convenient choices in the schedules attracted many more riders, while new trains shared overhead with the existing trains, so the robust ridership growth meant more revenue at less marginal cost. Illinois also added a second train to Galesburg and another to Carbondale. Altogether it pays a modest yearly subsidy of less than $50 million, and ridership continues to grow. Using Stimulus funds, both the Chicago-St Louis route and the tracks Kalamazoo-Dearborn are being upgraded for 110-mph trains. New bi-level coaches (with 30% more capacity) and Next Gen quick-accelerating locomotives will be arriving for these and some other routes by 2017. The changes could cut an hour from the current schedules. Stimulus funds will also be used to create a new service Chicago-Quad Cities. The line was planned to go to Iowa City as part of this project, and eventually to extend to Des Moines and Omaha. But the State of Iowa refused to put any money into the project, so it will be truncated on the Illinois side of the border. Illinois has announced plans to restore service to Rockford and Dubuque, but work has not begun here. Four of the six stations busiest by boardings are on Amtrak's NEC: New York (Penn Station) (first), Washington (Union Station) (second), Philadelphia (30th Street Station) (third), and Boston (South Station) (sixth). The other two of the top six are Chicago (Union Station) (fourth) and Los Angeles (Union Station) (fifth). Introduced on February 7, 2014, new locomotives are set to replace some of the older ones on the NEC, reducing maintenance costs, thus increasing flexibility within the line's scheduling. They are known as the "Cities Sprinter" and will begin to replace the older fleet of locomotives at a rate of three per month until November 2016. Siemens built the new locos in their solar-powered facility in Sacramento, California. The new engines are state of the art and can reach speeds of 125 mph, shortening route time slightly. These engines will be implemented into the Keystone route as well within the forthcoming months. Most Amtrak trains have both names and numbers. Train routes are named to reflect the rich and complex history of the routes and the areas traversed by them. Each scheduled run of the route is assigned a number. Generally, even-numbered routes run northward and eastward, while odd-numbered routes run southward and westward. Some routes, such as the Pacific Surfliner, use the opposite numbering system, inherited from the previous operators of similar routes, such as the Atchison, Topeka, and Santa Fe Railway. Most NEC trains only have numbers. Acela: Boston – Washington, D.C. It should be noted that on-time performance is calculated differently for airlines than for Amtrak. A plane is considered on-time if it arrives within 15 minutes of the schedule. Amtrak uses a sliding scale, with trips under 250 miles (400 km) considered late if they're more than 10 minutes behind schedule, up to 30 minutes for trips over 551 miles (887 km) in length. Amtrak receives about a third of its passengers and almost half of its revenue through service over the Northeast Corridor, Boston-NYC-Washington, D.C. The route produces an operating surplus, most of it from the high-speed Acelas. The NEC does require considerable capital investment, and it is still many billions short of a "state of good repair". For example, most of the catenary south of New York dates from the Depression, when federal funds largely paid for the electrification, the tunnels under Baltimore are close to 150 years old, and several bridges are more than 100 years old and in need of replacement. But nationally, outside the Northeast Corridor, Amtrak is not a major player in passenger transportation. Ticket prices at Amtrak.com for travel on long distance routes has dramatically increased, while automobile transportation has decreased. Still, passenger rail travel in the U.S. rapidly declined since the mid-20th century. In fiscal year 2004 Amtrak routes served over 25 million passengers, while, in calendar year 2004, commercial airlines served 712 million passengers. Amtrak does serve the majority of major cities; however, service is often relatively slow, even by historical standards, and infrequent. For example, many routes only carry one to two trains in each direction per day. When it began operations on May 1, 1971, Amtrak implemented a drastically truncated system of trains compared to what had previously existed. Out of the 364 passenger trains that operated on April 30, only 182 were continued. Alaska was (and is) served by the Alaska Railroad, because it is disconnected from the rest of the US. Hawaii was excluded because it is outside the contiguous United States and last had passenger service in 1947. South Dakota's passenger trains, last run by the Milwaukee Road, were discontinued in 1968, prior to the start of Amtrak in 1971. Maine, New Hampshire, and Vermont were excluded because their last passenger trains were discontinued by the Boston and Maine in 1967, prior to the start of Amtrak in 1971. Vermont and New Hampshire gained service when the Montrealer was resumed in 1972. They lost service when the train was suspended in 1987, but regained service on its 1989 reintroduction. Then in 1995, service to Montreal was ended, but with a small subsidy from the State of Vermont, the train began to operate as the Vermonter. 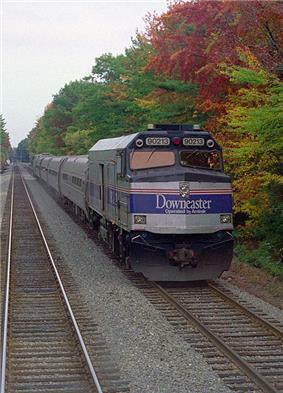 Maine and New Hampshire regained service in 2001 through the new Downeaster service, subsidized by the State of Maine, and exceeding all expectations for ridership and revenue. Wyoming lost rail service in the 1997 cut of the Pioneer. However, even within some of the states in which Amtrak operates, service is nominal at best. Many trains operate along borders and/or away from major population areas, such as in Idaho and Kentucky. Many major cities in the Midwest, West, and South have two or fewer trains per day, such as Atlanta, Denver, Cincinnati, Houston, Indianapolis, and Minneapolis–Saint Paul, or trains that only stop in the dead of night, like Cleveland, San Antonio, and Little Rock. Alaska is (still) served by the Alaska Railroad, rather than Amtrak. Its line is isolated from the rest of the North American system and connects only by rail barge. Hawaii does not have rail service apart from small tourist railroads on some islands, however an elevated railroad line is under construction on the island of Oahu. Large inter-city rail lines are not possible due to the state's geography. Amtrak train in downtown Orlando, Florida. In 1983, the Silver Meteor and Silver Star, between New York and St. Petersburg, Florida, were truncated to Tampa because Amtrak was unable to take on the costs of maintaining the Seaboard Coast Line Railroad drawbridge, which had allowed the train to cross Tampa Bay. The Sunset Limited was rerouted in 1997 to stop at Maricopa, 37 miles south of Phoenix, Arizona, after the Union Pacific Railroad decided to abandon the trackage that served Phoenix. 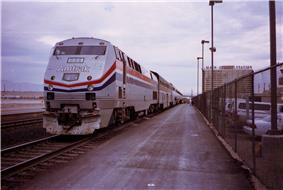 Amtrak did not have the funds to maintain the trackage, and connects Phoenix to Maricopa by an Amtrak bus. The San Joaquin service runs from Oakland with four round-trips daily and from Sacramento with two roundtrips, through California's Central Valley, stopping at Stockton, Merced, Fresno, and other cities to Bakersfield. But it cannot run into Los Angeles south of Bakersfield because the Tehachapi Pass rail line, owned and operated by Union Pacific, is the busiest single track freight route in the country and thus UP prohibits passenger train use (except in emergency). Passengers must take an Amtrak Thruway Motorcoach bus service between Bakersfield and Los Angeles. The 120 mile bus route takes around three hours. Nonetheless, the state-supported San Joaquins have become a very successful route, now the fifth busiest in the Amtrak system. The upcoming California High Speed Rail corridor will run though the Tehachapi Pass on newly built trackage, thus re-introducing a direct rail link between Los Angeles and the Central Valley. Travel from Metro Detroit into Canada en route to Toronto was severely hindered when the owners of the freight tracks that go under the Detroit River wanted too much money for Amtrak to operate on them. Therefore in the early 2000s, travel on Amtrak from Detroit to Toronto required travel west to Battle Creek, then up through Lansing, Flint, then Port Huron, across the St. Clair River into Sarnia, then on to Toronto. Eventually, due to the obvious inconvenience and length of travel, service to Toronto directly from Michigan ceased altogether. Today would-be train travelers to Toronto are forced to use Via Rail out of Windsor or Sarnia, and to reach Via's stations they must cross the border on their own. The Desert Wind at Las Vegas, Nevada. Service stopped in 1997. Amtrak connects with Metra commuter trains, water taxis along the Chicago River, and nearby Chicago 'L' trains from Union Station in Chicago. The National Limited, a New York and Washington, D.C. train that provided direct service to Pittsburgh, Columbus, Ohio, Indianapolis, St. Louis, and Kansas City. After its discontinuance in 1979, Chicago was left as the only passenger rail connection between the Midwest and East. The North Coast Hiawatha, between Chicago and Seattle, had supplemented the Empire Builder service to the Pacific Northwest until 1979. The Hiawatha, running on a more southern route to Seattle than the Empire Builder, provided communities along that corridor with Amtrak service, in addition to providing another daily service between Chicago and Minneapolis–St. Paul. In October 1979, The Floridian, which was the last link with the vaunted Chicago–Florida services of such trains as the City of Miami, the Dixie Flagler, and the South Wind, was discontinued – along with the Louisville, Kentucky to Sanford, Florida Auto Train that the Floridian connected to in Louisville. This left the Midwest without any direct connections to Florida. Today passengers must travel east to Washington, D.C. to connect with the southbound Silver Star and Silver Meteor. In 1985, the local Minneapolis-St Paul to Duluth, Minnesota service, the North Star, was eliminated and replaced with through motorcoach service. In 1995, the Atlantic City Express service from New York and Washington D.C. to Atlantic City via Philadelphia, was replaced by New Jersey Transit passenger trains, which operated 14 daily trains in each direction between Philadelphia and Atlantic City. In 1997, the Desert Wind, which ran from Chicago by way of Denver through Salt Lake City to Las Vegas and Los Angeles was discontinued, as was the Pioneer, which ran from Chicago by way of Denver, Salt Lake City, and Boise to Portland and Seattle,. These cutbacks eliminated Amtrak service from Las Vegas, Boise, and all of Wyoming. 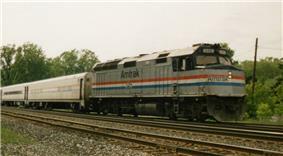 In 2003, Amtrak discontinued the Kentucky Cardinal, ending all service from Louisville, Kentucky, to Indianapolis and Chicago. In 2004 all Inland Route Northeast Regional trains between New York and Boston via Hartford and Springfield were moved to the Northeast Corridor. The New Haven – Hartford – Springfield segment still sees eight trains a day each way shuttle service. It is being upgraded with Stimulus funds to carry 17 trains a day, and the upgrades will allow a future restoration of an Inland Route train. In 2005, Three Rivers (a reborn Broadway Limited) was canceled, however New York to Chicago trains using the northerly (formerly New York Central) Lake Shore Ltd. route continued. 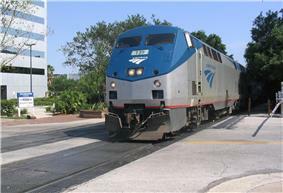 In 2005, the Sunset Limited, which offers three-days-a-week service between Orlando FL and Los Angeles CA, was affected by track damage along the Gulf Coast caused by Hurricane Katrina. This resulted in the train being "temporarily" truncated to the segment between New Orleans LA and Los Angeles CA. Although the track's owner, CSX, completed repairs by early 2006, Amtrak service has not resumed service between New Orleans and Orlando. This is the only example so far of a route affected by both service cuts and freight railroad issues. According to August 2010 issue of Trains Magazine, the Southwest Chief currently faces challenges regarding moves made by BNSF to cease all freight operations between La Junta, CO, and Lamy, NM. It has been reported that BNSF told Amtrak that as of January 1, 2010, all maintenance costs were to be covered by Amtrak if they wished to continue routing the train over the same right-of-way. Furthermore, BNSF has also declared that it will maintain the tracks between Hutchinson, KS, and La Junta, CO, at a Class 2 (30 mph (48 km/h) passenger train maximum) speed instead of a Class 4 (79 mph (127 km/h) passenger train maximum), again handing the bill over to Amtrak if they wanted to see service continue at a Class 4 level. These moves have led BNSF to offer to host the Southwest Chief over BNSF's currently used freight routes via Wichita, Wellington, KS, Amarillo, and Clovis, NM. However, Amtrak is seeking help from the states to pay the bill in order to keep the service as it currently is. Three intermediate stops along the route of the Empire Builder in North Dakota are on the chopping block due to complications arising from Devils Lake, also according to the August 2010 issue of Trains Magazine. Because Canada will not allow the waters of the lake to drain within its borders, the lake is slowly rising and threatens to submerge the BNSF right-of-way located near it. As a result, BNSF has ended freight service between Devils Lake and Churchs Ferry, handing the cost of maintenance over to Amtrak. North Dakota's Congressional delegation has declared that there will be no reroute, as suggested by BNSF, to go directly between Fargo, ND, and Minot, ND, and possibly serve New Rockford, ND; instead, they have declared that they will "find the necessary funding needed" in order to help Amtrak cover the maintenance costs. Annual Ridership by fiscal year 1971 - 2012. Outside of the Northeast Corridor, most Amtrak trains run on tracks owned and operated by privately owned freight railroads. Freight rail operators are required under federal law to give dispatching preference to Amtrak trains. Some freight railroads have been accused of violating or skirting these regulations, allegedly resulting in passenger trains waiting in sidings for an hour or longer while waiting for freight traffic to clear the track. The railroads' dispatching practices were investigated in 2008, resulting in stricter laws about train priority which had a dramatic result. Amtrak's overall on-time performance went up from 74.7% in fiscal 2008 to 84.7% in 2009, with long-distance trains and others outside the NEC seeing the greatest benefit. The Missouri River Runner jumped from a very poor 11% to 95%, becoming one of Amtrak's best performers. The Texas Eagle went from 22.4% to 96.7%, and the California Zephyr, with an abysmal 5% on-time record in 2008, went up to 78.3%. However, this improved performance also coincided with a general economic downturn, resulting in the lowest freight rail traffic volumes since at least 1988, meaning less freight traffic to impede passenger traffic. Passengers carried on Amtrak trains for each fiscal year (1971–2010 data:). EMD F59PHI locomotive used for Capitol Corridor and San Joaquin service. Note the locomotive is owned by the California Department of Transportation rather than Amtrak itself. Amtrak Express (reporting marks AMTK, AMTZ) provides small-package and less-than-truckload shipping among more than 100 cities. Amtrak Express also offers station-to-station shipment of human remains to many express cities. At smaller stations, funeral directors must load and unload the shipment onto and off the train. Amtrak hauled mail for the United States Postal Service and time-sensitive freight, but canceled these services in October 2004 due to minuscule profits. On most parts of the few lines that Amtrak owns, trackage-rights agreements allow freight railroads to use its trackage. Amtrak's Capitol Corridor, Pacific Surfliner (formerly San Diegan), and San Joaquin are funded mostly by the California Department of Transportation (Caltrans), rather than the US Federal Government. Amtrak has a variety of coaches that suit a variety of needs. Class choices are similar to those used by airlines. 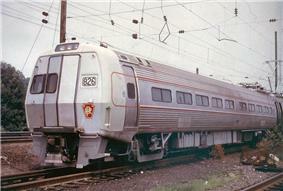 Bi-level Superliner cars, used on long-distance routes, except in the Northeast because of low vertical clearances and incompatibility with high-level platforms. First Class service is currently offered on the Acela Express only. Previously First Class was offered on the Northeast Direct (predecessor to the Northeast Regional) as well as the Metroliner up until that service's discontinuation in 2006. Seats are larger than those of Business Class and come in a variety of seating modes (single, single with table, double, double with table and wheelchair accessible). First Class is located in separate cars from the other classes. First Class includes complimentary meal and beverage service along with free newspapers and hot towel service. First Class seats are set in a 1x2 configuration. There are two attendants per car. First Class passengers have access to Amtrak ClubAcela lounges in Washington D.C., Philadelphia, New York and Boston. ClubAcela lounges offer complimentary drinks, personal ticketing service, lounge seating, conference areas, computer/internet access and televisions tuned to CNN. At the Philadelphia, Chicago (Metropolitan Lounge) and Washington, D.C. lounges, passengers can board their train directly from the lounge. In Philadelphia passengers use an elevator to access the train, while in Washington and Chicago passengers leave through a side door leading to the train platform. The interior of a Pacific Parlour Car. Sleeper Service rooms are considered First Class on long-distance trains. Rooms are classified into roomettes, bedrooms, family bedrooms and accessible bedrooms. With the price of a room come complimentary meals and attendant service. At night, rooms turn into sleeping areas with fold-down beds and fresh linens. Complimentary juice & bottled water, newspapers and turn down service are included as well. Sleeper car passengers have access to the entire train. Sleeper passengers also have access to the ClubAcela lounges in stations along the NEC, access to the Metropolitan Lounges in Chicago, Los Angeles and Portland (Oregon) and access to unattended first class lounges in Miami, New Orleans, Raleigh, St. Louis and St. Paul/Minneapolis. Sleeper car passengers on the Los Angeles – Seattle Coast Starlight also have access to the Pacific Parlour Car (PPC). 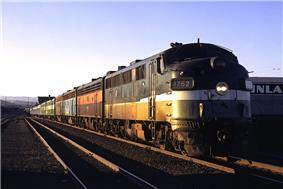 The PPCs were converted from the famous ex-Atchison, Topeka and Santa Fe Hi-Level cars of the 1950s. 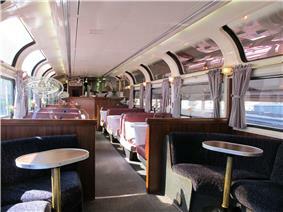 The Pacific Parlour Car has a bar with a dedicated staff attendant, tables for meals, and comfortable swivel chairs. Downstairs is a movie theater for sleeping car passengers only. Business Class is the minimum class of service on the Acela Express and is offered as an upgrade on Northeast Regional and similar trains. Business Class passengers also receive complimentary non-alcoholic beverages and newspapers (typically The New York Times, even if boarding/originating outside New York City). 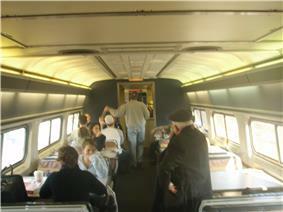 Some trains feature Business Class seats at one end of the Cafe Car. These leather seats recline substantially, are in a 1x2 layout, and feature cup holders and leg rests. 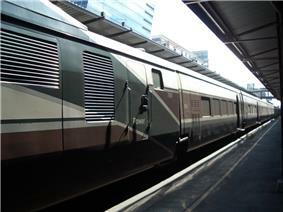 Other trains feature dedicated Business Class cars. Compared to Regional Coach cars, Business Class cars generally have more comfortable seats, more legroom, and foot rests. The cloth seats are organized in a 2x2 layout and offer North American standard (120 V, 60 Hz) electrical outlets along the windows, but lack cup holders. One end of this car type normally has open floor space for luggage that will not fit in the overhead racks. Reserved Coach in a Superliner. 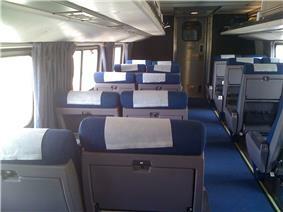 Amtrak has several variations that it considers Coach Class. Regional Coach is found on shorter (day) routes such as the Northeast Regional, Empire Service, the Keystone, and the Downeaster. Seats in this type of car are comparable to economy seating on airlines, but have more generous legroom and recline further. Long Distance Coach is mostly found on overnight sleeper routes, such as the Empire Builder and the Lake Shore Limited. These seats have a much deeper recline, more legroom, legrests, footrests, and North American standard (120 V, 60 Hz) power outlets along the windows. Long distance coaches also run on longer daytime trains in the east, and can substitute for corridor coaches on other short distance lines. All ticketed passengers are guaranteed a seat, although passengers are not assigned a specific seat on their tickets. The lack of advance seat assignment is unlike Canada's Via Rail and many long-distance train services in Europe. If the train is not sold out, passengers are usually permitted to purchase tickets on the day of departure, or in some cases aboard the train. Unreserved Coach seating is offered on a first-come, first-served basis on some of Amtrak's shorter distance and commuter-oriented routes. Unreserved coach is also used as a designator when Amtrak through-books an itinerary with a regional transit operator's commuter service (such as New Jersey Transit's Atlantic City Line). A southbound Downeaster passenger train at Ocean Park, Maine, as viewed from the cab of a northbound train. Most tracks on which Amtrak operates are owned by freight railroads, but Amtrak owns the rail track in most of the NEC and a few other places. Amtrak operates over all Class I railroads in the United States, as well as several regional railroads and short lines. Other sections are owned by terminal railroads jointly controlled by freight companies or by commuter rail agencies. Amtrak is able to do this because it has trackage rights, but it does not maintain those tracks or control train movements on those tracks. The host railroad is responsible for maintenance. Occasionally, Amtrak has suffered service disruptions from untimely track rehabilitation. When host railroads have simply refused to maintain their tracks to Amtrak's needs, Amtrak occasionally has been compelled to pay the host to maintain the tracks. Amtrak has priority over freight traffic only for a specified and small window of time. When a passenger train misses that window, for example due to an earlier delay, host railroads may (and frequently do) direct passenger trains to follow slower freight traffic. This means that even minor delays quickly become major delays. In some cases, an unauthorized delay caused by a freight railroad might expose the host railroad to financial penalties by law. 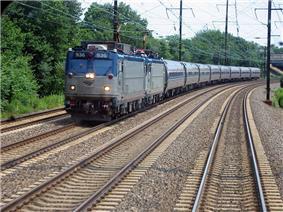 An electric Amtrak train with two AEM-7 locomotives running through New Jersey on the Northeast Corridor. The Northeast Corridor between Washington, D.C. and Boston via Baltimore, Philadelphia, Newark, New York and Providence is largely owned by Amtrak, working cooperatively with several state and regional commuter agencies. Between New Haven, Connecticut and the New York/Connecticut border (Port Chester/Greenwich) the track is owned by the state of Connecticut. Between Port Chester, NY and New Rochelle, NY the track is owned by the MTA. This line runs from Philadelphia to Harrisburg, Pennsylvania. As a result of an investment partnership with the Commonwealth of Pennsylvania, signal and track improvements were completed in October 2006 that allow all-electric service with a top speed of 110 miles per hour (180 km/h) to run along the corridor. The tracks across the Whirlpool Rapids Bridge and short approach sections near it. 60.5 miles (97.4 km), New Haven to Springfield (Northeast Regional, Vermonter, and especially the New Haven–Springfield Shuttle). Amtrak also owns station and yard tracks in Chicago, Los Angeles, New Orleans, New York City, Oakland (Kirkham Street Yard), Orlando, Portland, Oregon, Saint Paul, Seattle, and Washington, D.C.
Amtrak leases station and yard tracks in Hialeah, near Miami, Florida, from the State of Florida. Amtrak owns the Chicago Union Station Company (Chicago Union Station) and New York Penn Station. It has a 99.7% interest in the Washington Terminal Company (tracks around Washington Union Station) and 99% of 30th Street Limited (Philadelphia 30th Street Station). Also owned by Amtrak is Passenger Railroad Insurance. 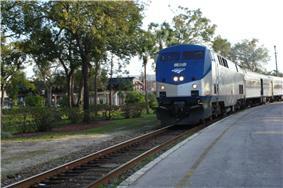 Northbound Silver Star heading to New York in Winter Park, Florida. 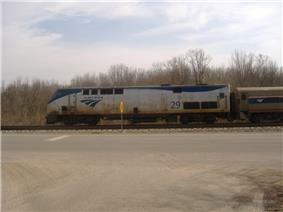 In this 2008 photo, Amtrak P42DC Locomotive No. 29 waits in Comstock, Michigan, for a westbound train to pass. An Amtrak EMD F59PHI locomotive parked in Solana Beach, CA on Pacific Surfliner service. Amtrak offers different, often historical, views of America from earlier times. Pictured is the Amtrak station in Hammond, Louisiana, refurbished with a modern railway platform. 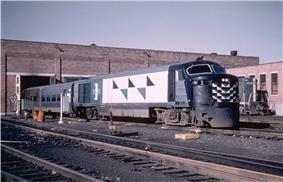 The Carolinian stopping in Raleigh, North Carolina in "Phase V" livery. Acela Express Boston – Washington, D.C.
Amtrak owns 2,142 railway cars and 425 locomotives for revenue runs and service. Examples include the GE P42DC, the EMD AEM-7, the Amfleet car and the Superliner car. Occasionally private cars, or loaned locomotives from other railroads can be found on Amtrak trains. Unlike many large businesses, subsequent to its formation Amtrak has had only one active investor: the U.S. government. Like most investors, the federal government has demanded a degree of accountability. Determination of congressional funding and selection of Amtrak's leadership have been infused with political considerations. As discussed below, funding levels and capital support have varied over time. Like many railroads, some members of Amtrak's board have had little or no experience with railroads. Conversely, Amtrak also has benefited from the interest of highly motivated and politically oriented public servants. For example, in 1982, former Secretary of the Navy and retired Southern Railway head William Graham Claytor Jr. brought his military and railroad experience to the job. Graham Claytor earned distinction as a lawyer (he was president of the Harvard Law Review and law clerk to U.S. Judge Billings Learned Hand and Supreme Court Justice Louis Brandeis); as a transportation executive (he joined the Southern as vice president-law in 1963, became president in 1967, and retired in 1977, five years before he took over the command at Amtrak); and as a public servant (he was President Carter's Secretary of the Navy, Deputy Secretary of Defense, and, briefly, Acting Secretary of Transportation, all between his two railroad careers). Claytor came out of retirement to lead Amtrak after the disastrous financial results during the Carter administration (1977–1981). He was recruited by then Secretary of Transportation, Drew Lewis, and Federal Railroad Administrator Robert Blanchette, both Reagan appointees. Despite the fact that Claytor frequently opposed the Reagan Administration over Amtrak funding issues, he was strongly supported by John H. Riley, an attorney who was the highly skilled head of the Federal Railroad Administration (FRA) under the Reagan Administration from 1983 to 1989. Claytor, the longest serving Amtrak CEO, at 12 years, clearly enjoyed a good relationship with Congress and was perceived by many in the rail industry and government to have done an outstanding job of running Amtrak. Due to limited federal funding, Claytor was forced to use short-term debt to keep most of its operations running. Also, during the Reagan Administration, Secretary of Transportation Elizabeth Dole tacitly supported Amtrak. In the 1990s, Claytor was succeeded at Amtrak's helm by a succession of career public servants. First, Thomas Downs, who had overseen the Union Station project in Washington, D.C., which experienced substantial delays and cost overruns, assumed the leadership. Amtrak faced a serious cash crisis during 1997. However, Tim Gillespie, Amtrak's highly regarded vice president for government affairs for almost two decades, persuaded Congress to include a provision in the Taxpayer Relief Act of 1997 that resulted in Amtrak receiving a $2.3 billion tax refund that resolved their cash crisis. In January 1998, after Amtrak weathered this serious cash shortfall, Michael Dukakis served as Amtrak's vice chairman of the board and was nominated as a director by President Bill Clinton in 1998. 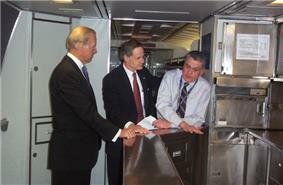 David Gunn (right) with Senator Joe Biden and Senator Tom Carper touring Amfleet dinette 28351's dining facilities in 2003. In April 2002, David L. Gunn was selected as president. Gunn had a strong reputation as a straightforward and experienced manager. Years earlier (between 1991 and 1994), Gunn's refusal to "do politics" put him at odds with the Washington Metropolitan Area Transit Authority board of directors, which included representatives from the District of Columbia and suburban jurisdictions in Maryland and Virginia. Gunn was an accomplished public servant and railroad person and his successes before Amtrak earned him a great deal of credibility, despite a sometimes-rough relationship with politicians and labor unions. Gunn was polite but direct in response to congressional criticism of Amtrak, and his tenure was punctuated by successes in reducing layers of management overhead in Amtrak and streamlining operations. Amtrak's Board of Directors removed Gunn on November 9, 2005. The board then appointed David Hughes, Amtrak's Chief Engineer, as interim CEO. Given Gunn's solid performance, many Amtrak supporters feared that Gunn's departure was Amtrak's death knell, although those fears were not realized. On August 29, 2006 Alexander Kummant was named as Gunn's permanent replacement effective September 12, 2006. Kummant resigned on November 14, 2008. The board appointed Amtrak COO William Crosbie as interim CEO. Soloman, Brian (2004). Amtrak (Mbi Railroad Color History). MBI. Hanus, Chris and Shaske, John (2009). USA West by Train: The Complete Amtrak Travel Guide. Way of the Rail Publishing. Pitt, John (2008). USA by Rail. Bradt Travel Guides. Solomon, Brian (2004). Amtrak. Saint Paul, MN: MBI. Edmonson, Harold A. (2000). Journey to Amtrak: The year history rode the passenger train. Kalmbach Books. "GAO-06-145 Amtrak Management: Systemic Problems Require Actions to Improve Efficiency, Effectiveness, and Accountability" (PDF). Archived from the original on November 25, 2005. Retrieved November 23, 2005. 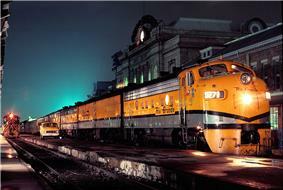 ^ National Railroad Passenger Corporation. "Foreword". Annual Report Fiscal Year 2011. National Railroad Passenger Corporation. Retrieved 30 July 2012. ^ "Amtrak Fact Sheet". Web.archive.org. 2008-01-20. Archived from the original on 2014-04-07. Retrieved 2013-06-25. ^ "National Fact Sheet: FY 2012" (PDF). Amtrak.com. May 2013. Retrieved October 14, 2013. ^ National Railroad Passenger Corporation. "Basic Amtrak Facts". National Amtrak Facts, FY 2011. National Railroad Passenger Corporation. Retrieved 30 July 2012. ^ "Amtrak National Facts". Amtrak. Retrieved February 12, 2012. ^ Puentes, Robert; Adie Tomer; and Joseph Kane (March 2013). "A New Alignment: Strengthening America’s Commitment to Passenger Rail". The Brookings Institution. Retrieved 27 November 2013. ^ "Amtrak Fact Sheet, Fiscal Year 2008 District of Columbia". Amtrak Government Affairs. November 2008. Retrieved August 27, 2011. ^ Amtrak History and Archives. Accessed March 6, 2013. ^ "Amtrak National Facts". Amtrak. Archived from the original on January 20, 2008. Retrieved June 12, 2008. ^ a b c d e f g Schafer, Mike; Welsh, Joe; Holland, Kevin J. (2001). The American Passenger Train. Saint Paul, MN: MBI. ^ a b c d Carper, Robert S. (1968). American Railroads in Transition; The Passing of the Steam Locomotives. A. S. Barnes. pp. 112–113. ^ Williamson, Samuel H. (2008). "Six Ways to Compute the Relative Value of a U.S. Dollar Amount, 1774 to Present". MeasuringWorth. Archived from the original on May 21, 2008. Retrieved June 16, 2008. ^ Hosmer, Howard; et al. (1958). ﻿Railroad Passenger Train Deficit﻿ (Report). Interstate Commerce Commission. 31954. ^ Daughen, Joseph R.; Binzen, Peter (1971). The Wreck of the Penn Central. Mentor Books. pp. 213–214, 255, 310–311. ^ a b c d e Morgan, David P. (April 1959). "Who Shot the Passenger Train?". Trains: 14–15, 20–21. ^ a b c Slason Thompson, A Short History of American Railways, Books for Libraries Press: Freeport, NY (1925, reprinted 1971), p. 324–391, 405. ^ "Railroads". Funk & Wagnall's New Encyclopedia. History.com. 2006. Archived from the original on April 23, 2008. Retrieved February 6, 2010. ^ "United States". CIA World Factbook. Central Intelligence Agency. February 1, 2010. Archived from the original on February 5, 2010. Retrieved February 6, 2010. ^ William Wendt (July 30, 2007). "Hiawatha dieselization". Yahoo Groups. Retrieved February 7, 2010. ^ Gruber, John; Solomon, Brian (2006). The Milwaukee Road's Hiawathas. Voyageur Press. ^ Abbey, Wallace W. (November 1950). "Millions for Signals". Trains: 45–49. ^ "Ask Trains from November 2008". Trains Magazine. December 23, 2008. Retrieved August 28, 2011. ^ Shafer, Mike, supra at 125. Previously, individual states made those judgments, and the reform that came about with the Transportation Act of 1958 was intended to streamline the process. ^ "Brief History of the U.S. Passenger Rail Industry". ^ Study: NYS rail property taxes harm employment in rail, manufacturing - Feb. 11, 2002. Bcnys.org (2002-02-11). Retrieved on 2013-07-23. ^ Welsh, Joe; Bill Howes (2004). Travel by Pullman: a century of service. Saint Paul, MN: MBI. ^ a b Stover, John F. (1997). American Railroads (2nd ed.). Chicago: University of Chicago Press. ^ Sagert, Kelly Boyer (2007). The 1970s (American Popular Culture Through History). Greenwood Press. p. 218. ^ U.S. Federal Railroad Administration, Washington, DC. "Northeast Corridor Main Line." Accessed November 15, 2011. ^ a b Nice, David C. (1998). Amtrak: The History and Politics of a National Railroad. Lynne Rienner Publishers. p. 24. ^ Scheinberg, Phyllis F. (October 28, 1999). Intercity Passenger Rail; Amtrak Faces Challenges in Improving its Financial Condition (Report GAO/T-RCED-00-30) (PDF) (Speech). House Committee on Transportation and Infrastructure Subcommittee on Ground Transportation. Archived from the original on June 24, 2008. Retrieved June 12, 2008. ^ a b c d National Railroad Passenger Corporation. "Basic Amtrak Facts". Amtrak National Facts, FY 2011. National Railroad Passenger Corporation. Retrieved 30 July 2012. ^ Gunn, David L. (June 20, 2002). Testimony of David Gunn Before Senate Committee on Appropriations Subcommittee on Transportation and Related Agencies (Speech). Senate Committee on Appropriations Subcommittee on Transportation and Related Agencies. Retrieved June 12, 2008. ^ a b Szep, Jason (June 12, 2008). "Q&A with Amtrak President Alex Kummant". Reuters. Retrieved June 14, 2008. ^ "Amtrak President David Gunn Lectures at UIUC". CEE Alumni Association Newsletter, Online Edition (University of Illinois at Urbana-Champaign: CEE Alumni Association). Spring–Summer 2005. Archived from the original on August 25, 2007. Retrieved June 12, 2008. ^ Wald, Matthew L.; Don Phillips (December 23, 2006). "Surprising Forecast for Amtrak: Growth". The New York Times. Retrieved June 12, 2008. ^ "Gateway Project". Amtrak. February 2011. Archived from the original on February 7, 2011. Retrieved February 7, 2011. ^ National Railroad. "Bulletin Board (40th Anniversary Train Ends U.S.)". Amtrak Ink. National Railroad Passenger Corporation. Retrieved 30 July 2012. ^ "America’s Railroad Set to Celebrate 40th Anniversary". Amtrak Ink (Washington, D.C.: Amtrak). December 2010 – January 2011. Retrieved January 18, 2011. ^ Matt Van Hattem (May 2011). "New life for old schemes: For Amtrak's Beech Grove shop painters, it's deja vu all over again". Trains 71 (5): 15. ^ National Railroad Passenger Corporation. "eTICKETS NOW ACCEPTED ON EVERY AMTRAK TRAIN". Amtrak News Release (30 July 2012). National Railroad Passenger Corporation. Retrieved 30 July 2012. ^ "Amtrak Train Schedules, Timetables". Amtrak.com. Retrieved 2012-11-23. ^ Amtrak National Facts. Accessed July 2, 2008. Amtrak's 2007 fiscal year ran from October 2006 to September 2007. Does not include Canada. ^ "Table 1-37: U.S. Passenger-Miles". Bureau of Transportation Statistics. Archived from the original on October 2, 2006. Retrieved November 17, 2006. ^ "2005 Total Airline System Passenger Traffic Up 4.6% From 2004". Bureau of Transportation Statistics. April 27, 2006. Retrieved November 17, 2006. ^ Lindsell, Robert M. (2000). The Rail Lines of Northern New England. Branch Line Press. p. 175. ^ "Honolulu Transit". Honolulu Transit. 2012-11-18. Retrieved 2012-11-23. ^ a b Fred W. Frailey, "Minus its backbone, Amtrak makes a tempting target," Trains, August 2010, 18. ^ "Root Causes of Amtrak Train Delays". U.S. Department of Transportation. September 8, 2008. Retrieved February 4, 2010. ^ "Monthly Performance Report for September 2009". Amtrak. December 31, 2009. Retrieved February 4, 2010. ^ "Guest Rewards". Amtrakguestrewards.com. Retrieved 2012-11-23. ^ "Amtrak jettisons mail contracts". Railway Age. October 2004. Retrieved 14 June 2012. ^ National Railroad Passenger Corporation (2011). National Train Day Booklet: Los Angeles. Washington, DC: National Railroad Passenger Corporation. p. 14. ^ a b c d e f g h i "Amtrak - Plan - Onboard - Seating Accommodations". Amtrak Official Website. Retrieved January 6, 2014. ^ "Trains.com – Amtrak's Track". Retrieved November 23, 2005. ^ "Governor Cuomo Announces Hudson Rail Lease - Amtrak/CSX Deal Will Improve Passenger Service, Move Projects Forward" (PDF) (Press release). ^ "Email FS - FY02.xls" (PDF). Archived from the original on June 24, 2008. Retrieved November 23, 2005. ^ Zimmerman, Karl. Amtrak at Milepost 10. PTJ Publishing 1981. ^ Shutt, Anne (June 11, 1982). "In Short...". Christian Science Monitor. Retrieved June 12, 2008. 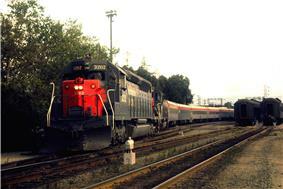 ^ a b c "Amtrak Board Releases Gunn" (Press release). Amtrak. November 11, 2005. Archived from the original on March 28, 2008. Retrieved June 12, 2008. ^ Wald, Matthew L. (April 27, 2002). "A New York Transit Rescuer Is Hired to Revive Amtrak". The New York Times. Retrieved June 12, 2008. ^ a b "Veteran Rail and Industrial Executive Alexander Kummant Appointed Amtrak President and CEO" (Press release). Amtrak. August 29, 2006. Retrieved June 12, 2008. ^ "Amtrak names a new president". Railway Age (Simmons-Boardman Publishing) 207 (9): 26. September 2006. ^ "Boardman named new Amtrak CEO". Trains.com. Kalmbach Publishing. November 25, 2008. Retrieved November 26, 2008. ^ "Fortune : Still chugging. (W. Graham Claytor Jr.) (Fortune People) (column) @ HighBeam Research". Archived from the original on December 14, 2005. Retrieved November 23, 2005. ^ "Official Amtrak Announcement". Amtrak.com. Retrieved 2012-11-23. 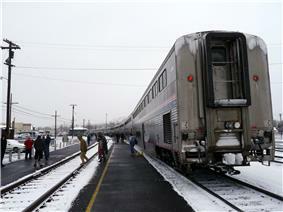 ^ "Boardman to head Amtrak for 'indefinite' period". Progressive Railroading. January 5, 2010. Retrieved January 6, 2010. ^ Amtrak President and CEO Joe Boardman named Railroader of the Year. Railway Age. Retrieved on 2014-04-12. ^ "Amtrak Myths & Facts: 4. Myth: Private Freight Railroad companies subsidize Amtrak.". National Association of Railroad Passengers. 3 August 2011. Retrieved 8 July 2012. ^ Matthew Wald and John Philips (December 23, 2006). "Surprising Forecast for Amtrak". New York Times. ^ a b "Amtrak FY13 Comprehensive Business Plan". May 2013. Retrieved 2013-10-08. ^ $709 million of the 1981 aid package was for operations. The remainder was capital appropriations. Vranich, Joseph. Derailed; What Went Wrong and What to Do About America's Passenger Trains. New York, NY: St. Martin's Press, p. 37 (1997). ^ "Senate committee ups Amtrak appropriation, cuts high-speed rail funding". Progressiverailroading.com. July 23, 2010. Retrieved December 29, 2010. ^ Karush, Sarah (June 11, 2008). "Amtrak funding bill approved by House". Associated Press. Retrieved June 14, 2008. ^ U.S. Conference of Mayors. "III. Transportation". Fiscal Year 2011 Appropriations (HR 1473). U.S. Conference of Mayors. Retrieved 30 July 2012. ^ Vranich, Joseph. End of the Line; The Failure of Amtrak Reform and the Future of America's Passenger Trains (2004). ^ Frailey, Fred W. Can Amtrak Survive the Budget Cutters?, U.S. News and World Report, p.52 (April 13, 1981). ^ "Federal Subsidies to Passenger Transportation". Bureau of Transportation Statistics. Archived from the original on June 9, 2009. Retrieved June 13, 2009. ^ "Rails Won't Save America" (PDF). October 2008. Archived from the original on October 14, 2008. Retrieved October 11, 2008. ^ "Midwest High Speed Rail Association". Midwesthsr.org. December 2, 2002. Archived from the original on April 24, 2008. Retrieved January 20, 2009. ^ "Road, Highway, and Transit Funding in Wisconsin" (PDF). 1000 Friends of Wisconsin. March 2007. Archived from the original on May 29, 2008. Retrieved May 26, 2008. ^ 91st Congress of the United States of America. "Section 301: Creation of the Corporation". Rail Passenger Service Act of 1970. United States Government. Retrieved 30 July 2012. ^ , sec. 4 n.21The Past and Future of U.S. Passenger Rail Service (September 2003). ^ American Association of State Highway and Transportation Officials. "CBO: Highway Account Faces Possible Insolvency Next Fiscal Year (28 Jan 2011)". AASHTO Journal. American Association of State Highway and Transportation Officials. Retrieved 30 July 2012. ^ http://www.buses.org/files/2008ABAFoundationComparativeFuelCO2.pdf table 1.1, figures from 2005. Cf. http://docs.wri.org/wri_co2comm_2002_commuting_protected.xls sheet 8, cell C33 (figures from 2002). ^ respectively http://docs.wri.org/wri_co2comm_2002_commuting_protected.xls sheet 8, cell C36 (figures from 2002); http://www.buses.org/files/2008ABAFoundationComparativeFuelCO2.pdf table 1.1, figures from 2007. ^ "figures from 2008–9." (PDF). Retrieved 2012-11-23. ^ "Figures from 2007" (PDF). Retrieved 2012-11-23. ^ Respectively http://lipasto.vtt.fi/yksikkopaastot/henkiloliikennee/raideliikennee/junat_henkiloe.htm figures for 2007; http://www.lipasto.vtt.fi/yksikkopaastot/henkiloliikennee/tieliikennee/linja-autote/latiee.htm figures for 2010. ^ Based on the 2008 Finnish data at http://lipasto.vtt.fi/yksikkopaastot/henkiloliikennee/ilmaliikennee/ilmae.htm. ^ Bizjak, Tony (November 30, 2010). "Amtrak to let passengers bring guns on most trains". ^ Carolyn Kellogg (February 24, 2014). "Amtrak launches writers residency after author requests". Los Angeles Times. ^ Tonya Mohn (March 14, 2014). "Inspiration on Rails: Amtrak Rolls Out Residencies for Writers". NBC News. ^ Vauhini Vara (February 24, 2014). "Writing Powered by Amtrak". The New Yorker. ^ Amtrak (March 8, 2014). "How to Apply for the Amtrak Residency for Writers". ^ Ben Cosman (February 21, 2014). "CULTURE: Inside Amtrak's (Absolutely Awesome) Plan to Give Free Rides to Writers". The Wire. ^ a b Dan Zak (March 12, 2014). "Pulling the brake on the Amtrak writer’s residency". Washington Post. ^ Amtrak. "Official Terms". #AMTRAKRESIDENCY: APPLICATION FORM. Retrieved March 25, 2014. ^ Harriet Staff (March 11, 2014). "POETRY NEWS: Writers Say ‘Not So Fast, Amtrak Residency’". Poetry Foundation. ^ Diane Duane (March 10, 2014). "The 'Amtrak Residency': Why I Think This Is A Really Bad Idea For A Writer". OutOfAmbit. ^ Victoria Strauss (March 12, 2014). "Rights Concerns: Amtrak Residency Program". Writers Beware. ^ Miral Sattar (March 25, 2014). "MediaShift: Lessons From the Rocky Launch of Amtrak’s Writing Residency Program". PBS. ^ "BiblioCrunch Residency Program". BiblioCrunch. Retrieved March 25, 2014. ^ Ben Cosman (Mar 11, 2014). "Nervous Writers Have Questions About Amtrak's Residency (and Amtrak Answers Them For Us)". The Atlantic Wire. Despite the program's popularity, some of the application's Official Terms (especially Section 6. Grant of Rights) have raised some concerns, prompting some writers to forego applying and urge others to follow suit. In response to those terms, BiblioCrunch has introduced its own residency program, whose introduction reads: "Feel uncomfortable about signing up for the Amtrak Residency program and still want a free ride and be able write without worrying about what you’re giving away? We’re giving away a trip on an Amtrak long distance roundtrip train ride from NYC to Florida. You pick either Orlando or Miami." On March 11, 2014, The Atlantic Wire '​s Ben Cosman summarized writers' concerns and Amtrak's response. The program, termed by Amtrak's Director of Social Media, Julia Quinn, "an idea dreamed up by Amtrak fans and customers", has received, she states: "an overwhelming reception, I don't think we could ever have anticipated how quickly so many people would respond to the idea of the program, and how liberally they're endorsing it". At the Washington Post, Dan Zak observed: "Fine print aside, the nation’s writers seem energized by the residency, if Twitter is any indication." CNN's Frances Cha describes the routes selected by the two writers who suggested the program in the first place, as well as some additional trip routes suggested by Amtrak and "fleshed out by wishful editors stuck in offices". In February 2014, Amtrak announced intentions to offer an Amtrak Residency for Writers and on March 8, opened a month-long call for applicants. The application is accessible at "How to Apply for the Amtrak Residency for Writers". The Wicker Amendment is United States federal legislation to allow rail travelers to put properly licensed, unloaded guns in checked Amtrak baggage. It reverses a decade-long ban on such carriage and came into effect on December 15, 2010. The policy change was promoted by the National Rifle Association and United States Senator Roger Wicker. In 2005, Amtrak's carbon dioxide equivalent emissions per passenger kilometre were 0.116 kg. For comparison, this is similar to a car with two people, about twice as high as the UK rail average (where much more of the system is electrified), about four times the average US motorcoach, and about eight times a Finnish electric intercity train or fully loaded fifty-seat coach. It is, however, about two thirds of the raw CO2-equivalent emissions of a long-distance domestic flight. Amtrak is constantly working to improve its carbon emissions. New electric locomotives, the ACS-64s, coming into service on the Northeast Corridor will be much more efficient, lighter weight, and include regenerative braking. Other new cars on order will also be much more energy efficient. To keep the controversy in perspective, Amtrak gets about $1.5 billion a year from the federal government for operations and capital investment. With a US population of more than 310 million, the Amtrak subsidy comes to less than $5 per citizen. Amtrak's total subsidy over more than 40 years is less than the transfers from the General Fund into the Highway Trust Fund in the past few years. Supporters of Amtrak and transit systems also point out that as the first decade of the 21st century came to a close, the user fees from the Highway Trust Fund did not cover the cost of maintaining the national highway system. Transportation advocacy groups such as the American Association of State Highway and Transportation Officials note that since 2008, the U.S. Congress has authorized transfers of money from the General Fund to the Highway Trust Fund to keep it solvent. Transfers from the General Fund to the Highway Trust Fund include: $8 billion (FY 2008); $7 billion (FY 2009); and $19.5 billion (FY 2010). The Rail Passenger Service Act of 1970, which established Amtrak, specifically states that "The Corporation will not be an agency or establishment of the United States Government," Common stock was issued in 1971 to railroads that contributed capital and equipment; these shares convey almost no benefits but their current holders declined a 2002 buy-out offer by Amtrak. There are currently 109,396,994 shares of preferred stock at a par value of $100 per share, all held by the US government. There are currently 9,385,694 shares of common stock with a par value of $10 per share held by four other railroad companies: APU (formerly Penn Central) 53%, BNSF (35%), Canadian Pacific (7%), and Canadian National (5%). Critics, such as the Cato Institute's Randal O'Toole, argue that gasoline taxes amount to user fees because people are taxed to the extent they use the roads. Others dispute this, as gasoline taxes are proportional to gasoline usage, not proportional to road usage. There is also still a significant amount of road spending that is not covered by the gas tax. It covers almost none of the costs for local streets and roads, and in many states little of the cost for state highways. Not taking these facts into account, though, O'Toole claims on page 2 of his report that "in 2006, Americans paid $93.6 billion in tolls, gas taxes, and other highway user fees. Of this amount, $19.3 billion was diverted to mass transit and other non-highway activities. At the same time, various governments – mainly local – spent $44.5 billion in property, sales, or other taxes on highways, roads, and streets. The net subsidy to highways was $25.1 billion, or about half a penny per passenger mile." O'Toole's road budget and passenger-mile numbers are disputed. In the same year, Amtrak receives direct subsidies of just over $1 billion, or 22 cents per passenger mile. According to the DOT Bureau of Transportation Statistics, rail and mass transit are considerably more subsidized on a per passenger-mile basis by the federal government (not including state and local subsidies, or hard-to-compute indirect subsidies) than other forms of transportation; the subsidy varies year to year, but exceeds $100 (in 2000 dollars) per thousand passenger-miles, compared to subsidies around $10 per thousand passenger-miles for aviation (with general aviation, i.e. private and corporate planes, subsidized considerably more per passenger-mile than commercial airline service), subsidies around $4 per thousand passenger-miles for intercity buses, and automobiles being a small net contributor through the gas tax and other user fees rather than being subsidized. On a total subsidy basis, aviation, with many more passenger-miles per year, is subsidized at a similar level to Amtrak. The analysis does not consider social costs and benefits, or difficult-to-quantify effects of some regulation, such as safety regulation. Along these lines, in a June 2008 interview with Reuters, Amtrak President Alex Kummant made specific observations: $10 billion per year is transferred from the general fund to the Highway Trust Fund; $2.7 billion is granted to the FAA; $8 billion goes to "security and life safety for cruise ships." Overall, Kummant claims that Amtrak receives $40 in federal funds per passenger, while highways are subsidized at a rate of $500–$700 per automobile. Moreover, Amtrak provides all of its own security, while airport security is a separate federal subsidy. Kummant added: "Let's not even get into airport construction which is a miasma of state, federal and local tax breaks and tax refinancing and God knows what." Proponents have pointed out that the government heavily subsidizes the Interstate Highway System, the Federal Aviation Administration, many airports, among many aspects of passenger aviation. Massive government aid to those forms of travel was a primary factor in the decline of passenger service on privately owned railroads in the 1950s and 1960s. In addition, Amtrak pays property taxes (through fees to host railroads) that highway users do not pay. Advocates have asserted that Amtrak should only be expected to be as self-sufficient as those competing modes of transit. Government aid to Amtrak was controversial from the beginning. The formation of Amtrak in 1971 was criticized as a bailout serving corporate rail interests and union railroaders, not the traveling public. Critics have asserted that Amtrak has proven incapable of operating as a business and that it does not provide valuable transportation services meriting public support, a "mobile money-burning machine." Many argued that subsidies should be ended, national rail service terminated, and the NEC turned over to private interests. "To fund a Nostalgia Limited is not in the public interest." Critics also question Amtrak's energy efficiency, though the U.S. Department of Energy considers Amtrak among the most energy-efficient forms of transportation. Amtrak has argued that it needs to increase capital program costs in 2013 in order to replace old train equipment because the multi-year maintenance costs for those trains exceeds what it would cost to simply buy new equipment that would not need to be repaired for several years. However, despite an initial request for more than $2.1 billion in funding for the year, the company had to deal with a year-over-year cut in 2013 federal appropriations, dropping to under $1.4 billion for the first time in several years. Amtrak stated in 2010 that the backlog of needed repairs of the track it owns on the Northeast Corridor included over 200 bridges, most dating to the 19th century, tunnels under Baltimore dating to the American Civil War Era and functionally obsolete track switches which would cost $5.2 billion to repair (more than triple Amtrak's total annual budget). Amtrak's budget is only allocated on a yearly basis which makes multi-year development programs and long-term fiscal planning difficult if not impossible. Amtrak points out that in 2010, its farebox recovery (percentage of operating costs covered by revenues generated by passenger fares) was 79%, the highest reported for any U.S. passenger railroad. With the dramatic rise in gasoline prices during 2007–2008, Amtrak has seen record ridership. Capping a steady five-year increase in ridership overall, regional lines saw 12% year-over-year growth in May 2008. In October 2007, the Senate passed S-294, Passenger Rail Improvement and Investment Act of 2007 (70–22) sponsored by Senators Frank Lautenberg and Trent Lott. Despite a veto threat by President Bush, a similar bill passed the House on June 11, 2008, with a veto-proof margin (311–104). The final bill, spurred on by the September 12 Metrolink collision in California and retitled Rail Safety Improvement Act of 2008, was signed into law by President Bush on October 16, 2008. The bill appropriates $2.6 billion a year in Amtrak funding through 2013. 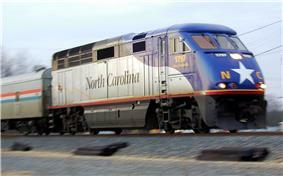 Amtrak's Piedmont near Charlotte, North Carolina with a state-owned locomotive. This route is run under a partnership with the North Carolina Department of Transportation. Amtrak Cascades service with tilting Talgo trainsets in Seattle, Washington. In 2004, a stalemate in federal support of Amtrak forced cutbacks in services and routes as well as resumption of deferred maintenance. In fiscal 2004 and 2005, Congress appropriated about $1.2 billion for Amtrak, $300 million more than President Auto Train and Empire Builder services continue regular made-on-board meal service. In 2010 the Senate approved a bill to provide $1.96 billion to Amtrak, but cut the approval for high-speed rail to a $1 billion appropriation. Amtrak commenced operations in 1971 with $40 million in direct federal aid, $100 million in federally insured loans, and a somewhat larger private contribution. Officials expected that Amtrak would break even by 1974, but those expectations proved unrealistic and annual direct Federal aid reached a 17-year high in 1981 of $1.25 billion. During the Reagan administration, appropriations were halved and by 1986, federal support fell to a decade low of $601 million, almost none of which were capital appropriations. In the late 1980s and early 1990s, Congress continued the reductionist trend even while Amtrak expenses held steady or rose. Amtrak was forced to borrow to meet short-term operating needs, and by 1995 Amtrak was on the brink of a cash crisis and was unable to continue to service its debts. In response, in 1997 Congress authorized $5.2 billion for Amtrak over the next five years – largely to complete the Acela capital project – on the condition that Amtrak submit to the ultimatum of self-sufficiency by 2003 or liquidation. Amtrak made financial improvements during the period, but ultimately did not achieve self-sufficiency. In late 2007 and early 2008, however, major labor issues arose, a result of a dispute between Amtrak and 16 unions regarding which employees should receive healthcare benefits. The dispute was not resolved quickly, and the situation escalated to the point of President Bush declaring a Presidential Emergency Board to resolve the issues. It was not immediately successful, and a strike was threatened to begin on January 30, 2008. In the middle of that month, however, it was announced that Amtrak and the unions had come to terms and January 30 passed without a strike. In late February it was announced that three more unions had worked out their differences, and as of that time it seemed unlikely that any more issues would arise in the near future. Because of the fragmentation of railroad unions by job, Amtrak has 14 separate unions to negotiate with. Plus, it has 24 separate contracts with those unions. This makes it difficult to make substantial changes, in contrast to a situation where one union negotiates with one employer. Former Amtrak president Kummant followed a cooperative posture with Amtrak's trade unions, ruling out plans to privatize large parts of Amtrak's unionized workforce. In recent times, efforts at reforming passenger rail have addressed labor issues. In 1997 Congress released Amtrak from a prohibition on contracting for labor outside of the corporation (and outside its unions), opening the door to privatization. Since that time, many of Amtrak's employees have been working without a contract. The most recent contract, signed in 1999, was mainly retroactive.